There are many words in Japanese to express a sudden shower on a sunny summer day. In summer, there are often strong showers in the late afternoon or evening, sometimes accompanied by wind and thunder. Since they occur mostly later in the day, they are called "evening shower", "evening cloudburst". They last no longer than one hour and afterwards one feels refreshed and it is bright again. They are formed by a certain weather pattern of upstream winds and regional low pressure systems. In the Kanto Area around Tokyo, in Yamanashi, Nagano and other provinces, they usually start around four in the afternoon and are gone by six. There people use the verbal form of "yuu tatsu　夕立つ". This is usually accompanied by wind, clouds and high waves, the air is blown up in the evening "yuugata ni ki ga tatsu: yuuki tatsu 夕気立つ", shortened to yuudachi. The meaning of the verb TATSU 立つ in natural phenomenon means something that is seen clearly with your eyes, the kanji should be arawareru, 顕れる, to reveal itself. This word is also used for mist and fog, the moon, a rainbow and other natural phenomenon. This verb TATSU 顕つ, revealing of natural phenomenon, is usually used during the summer season. The noun yuudachi 夕立 is used for the rain and the clouds that bring the rain. It is already used in the poetry collection of the Manyoo-Shu and others. My impression in the first hokku above is that there is a bit of irony in it. Issa might be wryly saying that the fierce storm hit every village in the area and overlooked or failed to hit only one little hamlet -- that is, it was a quite a storm. Or Issa might be expressing thanks for the one small omission the storm made. This humorous summer hokku was written in the 6th month (July) of 1818, a month after Issa's baby girl Sato was born. Issa seems to have been in very high spirits at this time; and his evocation of Sato's death the next year is in Year of My Life. During the 6th month of 1818 Issa's wife, as was common, stayed with her baby at her mother's house in the next village, while Issa, after visiting his wife and daughter for a while, made many short trips, staying with his students in the area. It seems likely that he took part in quite a few sake-drinking celebrations during this time. In the hokku, a sudden short, hard downpour is literally roaring down outside, giving an edge of excitement to the drinking party that's beginning. It's no doubt hot, so Issa and the others may have slipped off the top parts of their robes and sit stripped to the waist, though Issa may simply be using "strip to the waist" in its metaphorical sense, which is similar to "roll up your sleeves" in English. When there was heavy lifting to be done or a difficult task or job at hand, people would often speak of stripping to the waist and getting down to work with all their might. I take Issa to be using the phrase both literally and metaphorically. Perhaps Issa is beginning the drinking bout by noting how everyone has properly prepared for the major job that is about to commence by stripping down for action, and he reminds them that they'll have to work extremely hard with their small sake cups to be able to handle the large amount of sake they have to drink. The downpour outside suggests the sake will flow almost as freely as the rain. The to at the end of the third line indicates the second and third lines are reported speech. 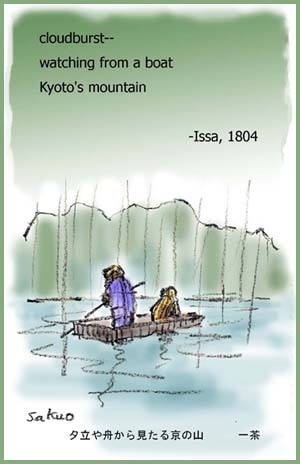 I take these two lines to be Issa's translation from rainese into Japanese of what he thinks the downpour is saying. The powerful sounds and force of the rain seem to be urging Issa and his companions to say things like, "Drink! Have a little more, just a little more!" A swallow hears the hard rain as music, and its steps and body movements accompany the rain, accentuating its rhythm, which is perceptible through all the noise. This humorous hokku is a variant written in Issa's hand of a hokku from the 6th month (July) in 1821. A short but intense cloudburst on the afternoon of a hot summer day completely soaks the mountain, and everywhere rivulets, streams, and waterfalls fill and overflow as the water rushes and splashes down the slopes. Trying to imagine how the mountain water must feel, Issa suggests the water is very proud of being so plentiful and full of energy at the moment, and it enjoys showing off the magnificent gift of water it has just received by performing endless acts of amazing spouting and splashing and falling through the air both on the slopes and in the streambeds that extend out from the foot of the mountain. A great many Japanese mountains were (and some still are) themselves regarded as gods -- as the divine bodies of the god of each mountain. Most mountain gods are believed to be female or sometimes a divine female-male couple, although the god of a mountain is often overlapped with the souls of ancestors from neighboring villages, so the "god" in the first line of the hokku may just as easily be "gods." For hunters and woodcutters, the mountain god is mainly a god of fertility who gives birth to and nurtures the plants and animals living on the mountain, but for farmers the mountain god is above all a god of water who supports and protects rice and other crops. Like other nature gods in Japanese shamanic folk religion, mountain gods are not almighty and are enmeshed in a wide-ranging divine social fabric. The mountain god in the hokku tries to provide water and other sustenance to people and animals who live near her, but she can't control when the weather gods will decide to drop rain or snow on her slopes. In Issa's hokku the mountain god is extremely happy to receive the divine gift of a real cloudburst, and she feels proud of her ability to now help the local farmers. She's hardly modest, and she shows off for all to see her new abundance not only with streams rushing down her slopes but with water surging through the various streambeds below the mountain that pass through many villages nearby, in one of which Issa lives. No doubt the villagers are very grateful for the mountain god's equally prodigious love of showing off and of giving away everything she gets. Unless there is a flood, that is.
. WKD : Yama no Kami　山の神 . In the old lunar calendar, the fifteenth day of Eighth Month is the time of the harvest moon. Ironically, a "cloudburst" (yuudachi), which is normally associated with summer, spoils this highlight of autumn. This hokku is from the sixth month (July) of 1820, when Issa was in his hometown. It must have been a dry summer that year, and the lack of rain is a problem. In the hokku, a hard but brief downpour has just fallen from a passing cloud, and it ends as suddenly as it began. Not enough rain has fallen to really help the farmers, and Issa uses humor to chide the rain for being so stingy. Instead of doing its job and keeping the earth watered and fertile, the rain is preoccupied with something else and only makes perfunctory visits now and then. According to the hokku, the rain knows people are criticizing it and demanding that it do something, so it has just made a spectacular though short appearance as if to say, "Don't blame me, I'm doing my best!"